My two sons are in cub scouts. The iconic cub scout activity is the pinewood derby. You are given a block of wood, four nails, and four wheels. There is no motor. Instead the cars start at the top of an incline and race down. The latest Brick Monsters release is available from drivethrurpg.com. 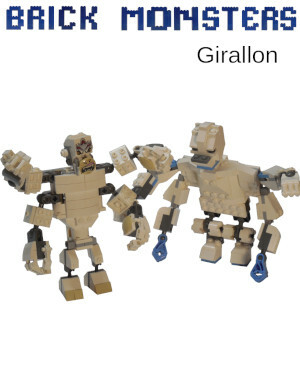 The girallon is a four armed white gorrilla. It appeared in the 3.5 edition. The creature was not included in the fifth edition SRD. Two builds are included as usual. The builds are very different. Even if you don't have all the pieces, the instructions might inspire you to create something with the bricks you own. The mpd file is included to allow you to conveniently order the parts using bricklink.com. I've been working through Make a 2D RPG in a Weekend (RPG Maker MV edition). It's taken slightly longer than a weekend due to distractions like playing with the kids. I believe the book achieves it's goal. It can allow you to make a 2D RPG in a weekend but has some limitations. 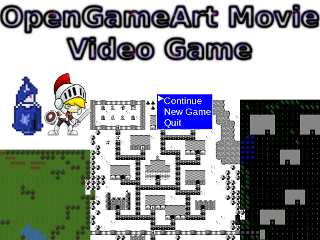 OpenGameArt Movie Video Game was an idea I had for OpenGameArt.org's Summer 2017 Game Jam. The idea being similar to the Lego Movie. I would take a bunch of artwork from OpenGameArt.org in different styles. The villain wanted to convert everything to one consistent style of the Liberated Pixel Cup. While on vacation I wanted to work on Color Monster but there was a problem. My wife had taken her tablet but it didn't load some of the sites she wanted to use or at least didn't run well. This led to her stealing my laptop. How do you do development without a computer? Last school year, my oldest was being tested on state names and their capitals. The grades didn't count. They were just trying to teach them how to study. My son didn't do as well as he wanted on the tests. For the last test I decided to help him study. I found an svg map of the United States. The test was the western states so I edited everything else out and printed out the map. 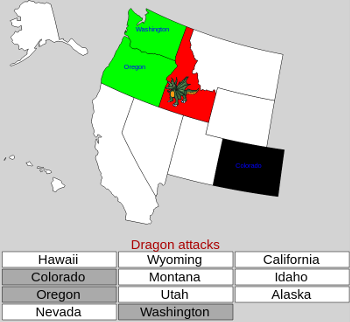 A list of state names, capital names, and monsters were made in LibreOffice. I cut apart all the names. The latest Brick Monsters release is available from drivethrurpg.com or rpgnow.com. The Eye of Deep is a sea dwelling eye beast. It appeared in the Tome of Horrors by Necromancer Games for 3.5 edition. The creature was not included in the Fifth Edition Foes. Hopefully our stats can help correct that missing foe. Two builds are included as usual. The builds are very different. Even if you don't have all the pieces, the instructions might inspire you to create something with the bricks you own. The mpd file is included to allow you to conveniently order the parts using bricklink.com. In planning a Star Wars game for May 4, I looked for adventure ideas. I stumbled on The Force of the Story. Steve Darlington's explanation of the important features of a Star Wars story really struck me as well defined. 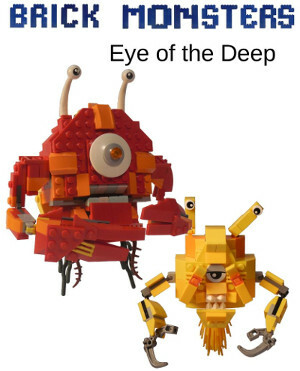 Brick Monsters is a combination of a Monster Manual and building instructions for Lego bricks. My goal is to include two different designs for the same monster along with suggestions of alternate possibilities if you don't have the needed pieces. It will also include monster stat sheets in some systems.I've been doing Dungeons and Dragons 3.5 and 5th edition but that might not always be the case.